Eclipse Aviation -- and company CEO Vern Raburn, in particular -- certainly have a flair for the dramatic. At a kickoff press event early Monday morning, before the gates opened at AirVenture 2007, the planemaker took the wraps off a concept model of its Eclipse Concept Jet: a single engine, four-passenger, slightly futuristic-in-appearance V-tailed aircraft intended to test the waters in the emerging Personal Jet category. But the planemaker didn't stop there. A line in Chief Operating Officer Peg Billson's speech describing the concept model -- an offhand remark about "flight testing" -- was drowned out by the unmistakable (muted) scream of a single Pratt & Whitney Canada PW610F turbofan, as the living and breathing ECJ made its debut. Many in attendance were surprised by the appearance of the aircraft (of course ANN was there during the aircraft's first flight on July 2.) Raburn told ANN that was the intent -- and, to show the aviation community Eclipse isn't standing still. "We kind of reject the notion that bigger is better," Raburn said, on the ECJ's smallish proportions. "What you’re seeing is an evolution of a marketplace. Think of this as a small sport sedan, such as a BMW 3 Series." 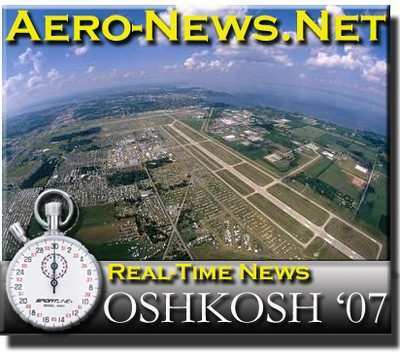 The ECJ was flown into Oshkosh Sunday night, following a six-month development schedule. Initial design kicked off in mid-January of this year. To date, the unpressurized concept aircraft has accumulated just under 30 flight hours, flying at speeds up to 250 knots and altitudes up to 25,000 feet and successfully demonstrated gear and flap operation since its very first flight. The ECJ has also conducted initial flutter testing, pre-stall testing, engine restart, and other flight envelope expanding test points. Raburn said only minor issues have cropped up during testing, including somewhat harsh pitch reactions to variations in throttle input. Eclipse plans to use the ECJ program to analyze demand trends within the growing single-engine jet marketplace, and gain customer insight on potential future aircraft products and designs. The initiative is modeled after the automobile industry's use of concept cars, which showcase advanced styling and technology to assess customer reactions to new car designs which may or may not eventually be produced and gauge the potential market size. The ECJ is estimated to cruise at a top speed of 345 knots and its service ceiling will be 41,000 feet. The aircraft's range is estimated to be 1,250 nautical miles. 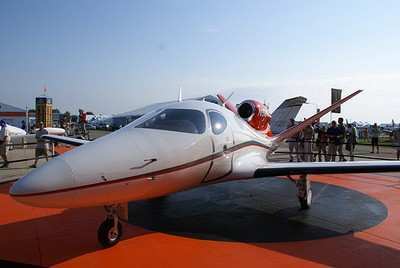 A unique element of the ECJ's aerodynamic design is its empennage, which features an external mounted engine pod and V-Tail vertical surfaces that create what Eclipse terms "exceptional" aerodynamic, weight, and operational benefits. The ECJ shares a number of design elements with the Eclipse 500. Common to the ECJ and the Eclipse 500 are the wing assembly minus the tip tanks, which includes the ailerons, the fuel system, main landing gear and actuators, flaps and flap actuators, wheels and brakes. The nose assembly is also common to both aircraft and includes the nose landing gear assembly, landing gear doors, forward pressure bulkhead, air conditioning and oxygen supply. 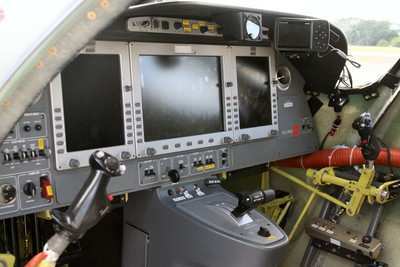 The ECJ also features Eclipse's all-electric Avio NG system, controlling aircraft computer systems, flight control trims, autopilot, electrical power distribution, FADEC, air data, AHRS, landing gear and flap actuation. All of the ECJ's major system components are controlled and managed using Avio NG, just as they are on the Eclipse 500. "When we first plugged in Avio NG into the panel [on the ECJ], within 30 minutes it was powered on," Raburn noted. The bench seat also has a vertical-tracking capability, allowing for a large amount of flexible leg room. Both rear passenger seats have access to 110V power plugs, cup holders and integrated MP3 player plugs for audio entertainment. Access into and out of the cabin is provided through one left side door, allowing simple entrance to flight deck and passenger seats. External baggage is available in the tail of the ECJ, which has the capacity to hold up to three full sets of golf clubs or skis. 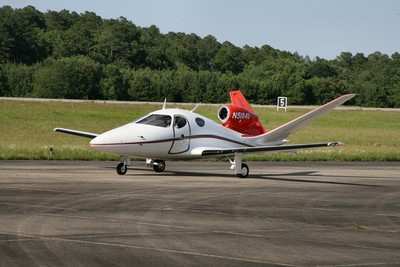 Raburn and Billson each stressed the relatively low cost in developing the ECJ, due in part to sharing "about 60 percent" component commonality with the twin-engine Eclipse 500. Additional development cost savings were realized by partnering with Swift Engineering of San Clemente, CA to assist with the design and subsequently build the Eclipse Concept Jet (ECJ) in slightly over six months. 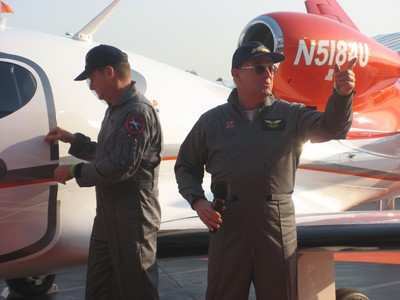 "Swift Engineering has been a tremendous partner, and was instrumental in taking this new aircraft from design to flight test so rapidly," said Raburn. "We needed a proven aerodynamics expert to aggressively drive this new initiative forward while we stayed focused on our core business of ramping up Eclipse 500 production and deliveries. Swift made it happen in record time." Swift constructed the plane at a facility at Wallops Island Flight Facility in Virginia -- also where initial flight testing has taken place -- with the support of BaySys Technologies of Onancock, VA and International Aero Engineering (IAE) of Bellflower, CA. Swift Engineering contracted the companies to support the aircraft build and the design of the interior cabin and flight deck. With primary responsibility for aircraft assembly, BaySys led a rapid build with care and precision; IAE, an expert in interior and exterior finishing produced the full-scale interior mockup, and painted both the mock-up and flight article.